There are few things more uncomfortable in life than trying to fall asleep, or stay asleep, when you’re too hot. Never fear: If you’re looking for the best cooling pillow, you’ve come to the right place. After sorting through expert opinions and hundreds of reviews from customers like you, our number one choice is the Beckham Hotel Collection Gel Pillow. Waking up sticky and sweaty is one of the easiest ways to ruin a perfectly good night’s sleep. Fortunately, cooling pillows breathe more easily than traditional pillows. This allows cooling air to circulate and helps to alleviate the discomfort of overheating. When it comes to the best pillows for staying cool, there are tons of options out there — so many, in fact, that it can be difficult to know where to start. This is especially true when many of the available pillows utilize different materials, different designs, and different unique features. Fortunately, you don’t have to do all the legwork in coming to a decision. 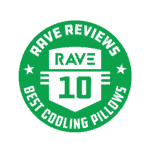 Below, you’ll find our list of 10 winners, as well as the pillows that took home the titles for the best budget, best eco-friendly, and best overall cooling pillows. These selections are based on real consumer data: All of our winners have been slept on and recommended by folks like you. Your search for the cool side of the pillow ends here. It’s affordable, it’s stylish, and most importantly of all, it does its job well. 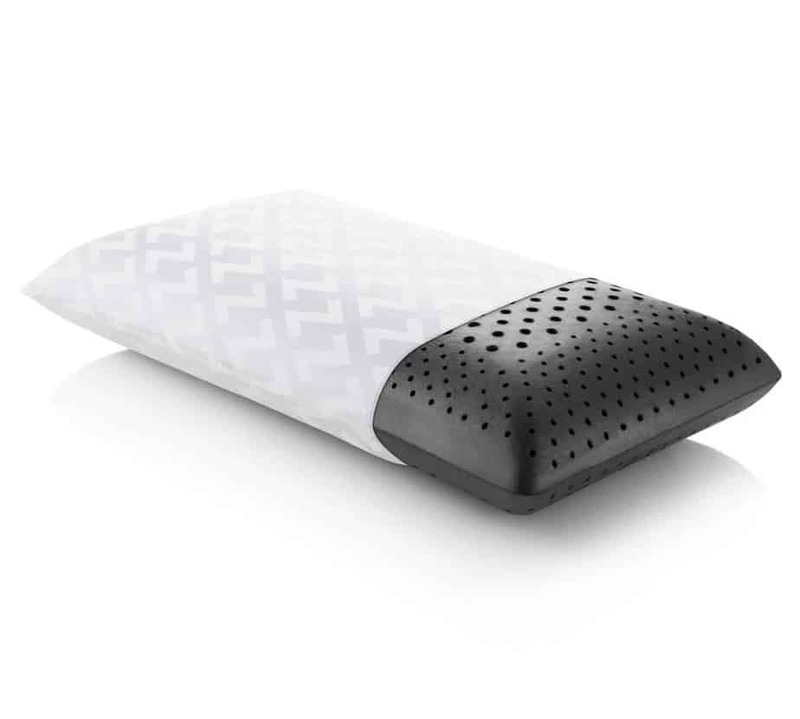 You can’t go wrong with the Beckham Hotel Collection Gel Pillow. If you want something larger than life with a price tag that’s anything but, then you should pay attention to this pillow. It’s cool to be eco-conscious, and this pillow uses sustainable materials and minimal packaging to support your environmentally friendly ideals. What is a cooling pillow, exactly? It’s all in the name. Simply put, it’s a specific type of pillow for your bed, which is designed to repel heat and remain cool. If you’ve ever spent a hot night looking for the cold spot on the pillow, then you’ll appreciate the niche. When it comes to staying cool, these pillows employ a variety of tactics. There are specialized types of fill that allow air to circulate better than your typical microfiber or down pillows. Some also opt for contoured designs to let air flow through more easily, cooling the skin through natural ventilation. Who Needs a Cooling Pillow? There’s not necessarily a perfect buyer for a cooling pillow, but some people can certainly benefit more than others. If you live in a hot climate, suffer hot flashes, or simply have a tendency to sleep hot, then a cooling pillow can help provide less disturbed, more restful sleep. It also never hurts to keep one aside for when you or a family member comes down with a fever. One of the most common designs is based on the use of gel in an external layer. Using heat conduction, excess heat is absorbed from the body into the gel. Once the heat is dispersed across the pillow’s gel layer, you’re left with a cooling feeling. The gel is typically combined with a memory foam design, offering greater support underneath the cooling layer. You can also get similar pillows that use water instead of gel. The efficiency of the cooling mechanism often depends largely on the product’s price and build quality. Alternatively, you could opt for breathable materials in the pillow design. 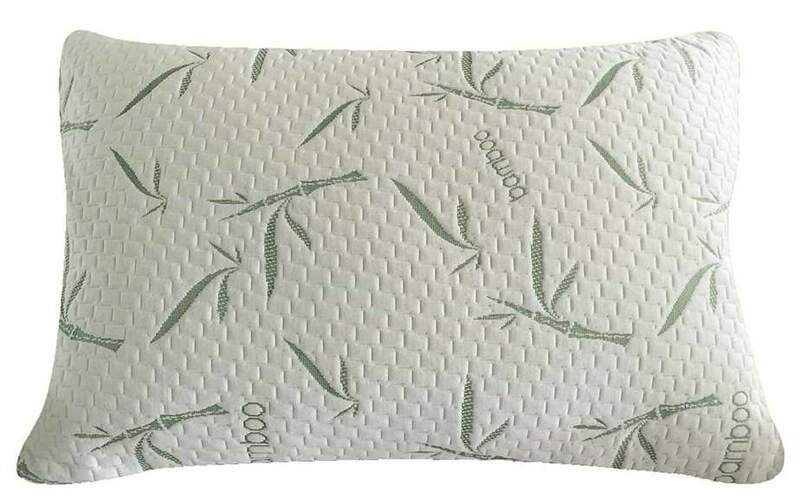 Bamboo and buckwheat are popular choices in the manufacturing of cooling pillows. They don’t retain heat and allow air to circulate, which produces a cooling effect. Finally, you have the pillows filled with Phase Change Materials, or PCM. These are typically combined with memory foam and can change between a liquid and solid state. While changing state, the pillow can release or absorb heat. 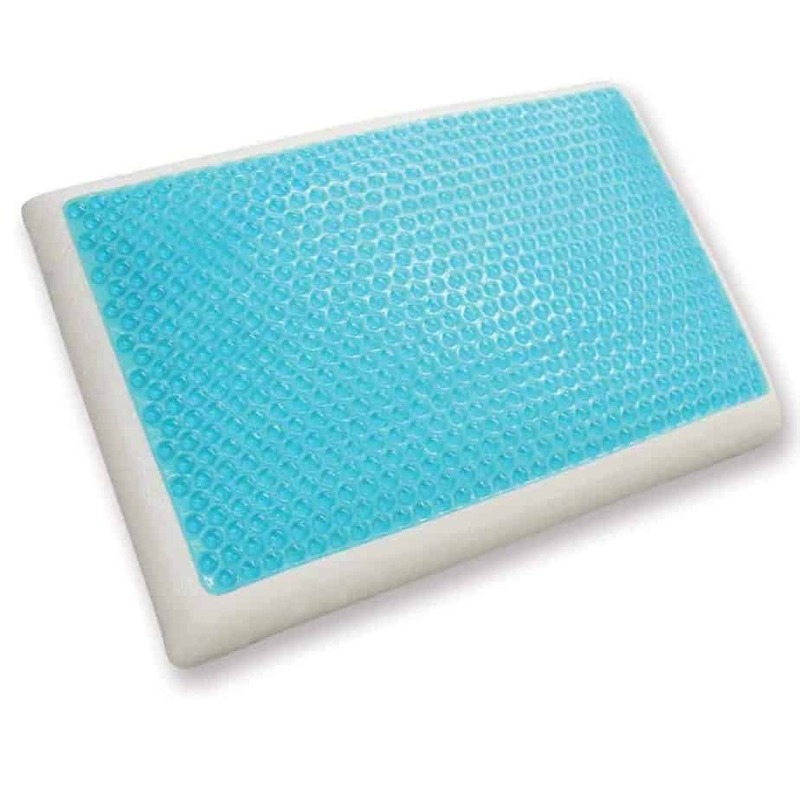 Memory foam is one of the most popular choices for cooling pillows. It molds directly to your shape, easing pressure points and providing custom support. Some premium designs use shredded memory foam, which improves airflow, keeping you cooler. If you’re looking at memory foam pillows, there are a couple of drawbacks to bear in mind. Stomach sleepers may find them too high, since memory foam is denser than other types of material. 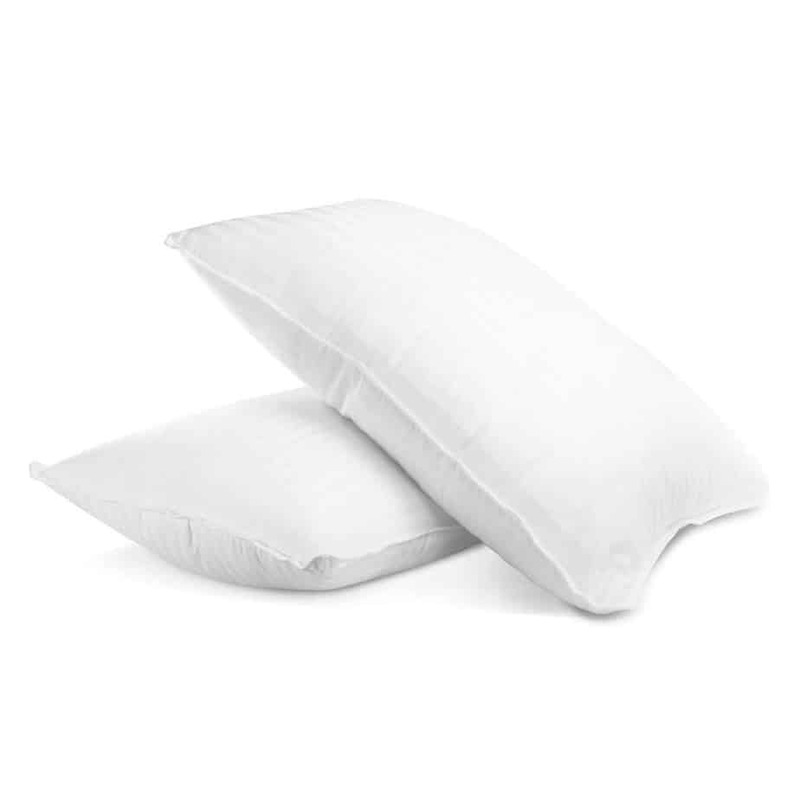 These pillows will also usually have a temporary chemical smell until properly aired out for 24 to 48 hours. If you’d prefer something similar to down, or more environmentally friendly than standard memory foam, there’s gel fiber. It feels just like down, and unlike memory foam, it can go straight into the washer when it needs a good cleaning. It can also be refreshed in the dryer if it starts to lose its fluff. Lastly, you’ve got all-natural fillings like bamboo and buckwheat. These are your best choice for hypoallergenic pillows, and they’re also some of the best-ventilated materials for cooling pillows. Keeping your pillow clean can be an uphill battle if you tend to drool. Even if you don’t, you sleep on them every day, so they’re going to need cleaning eventually. It’s worth knowing how each type of pillow can — or can’t — be cleaned. You should never machine-wash a gel pillow. Instead, wash it by hand and leave it to air dry. On the other hand, those that use a water layer can typically go into the washer. Just be sure to remove the water-filled pouch first. 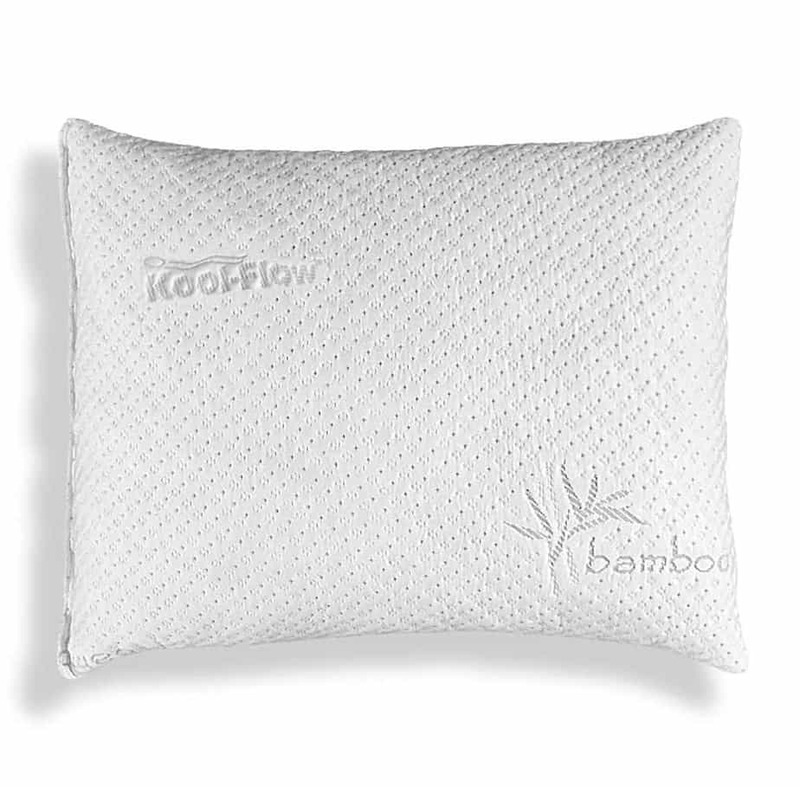 Bamboo pillows are normally fine to machine-wash, though check your labels first. Buckwheat isn’t so easily washed, as the washer will damage the internal structures. Stick to hand washing for these pillows. As a general rule, don’t put any pillow in the wash that uses memory foam, as it will be ruined. However, a quick tumble dry can be the perfect way to refresh a pillow losing its shape. As always, refer to your labels first. We don’t guess at which products are best, nor recommend pillows based on sales revenue. Instead, we aggregate reviews from a variety of online sources, determining which products are most loved by experts and everyday consumers alike. We then examine the top-ranking products to see how each pillow fares in key areas. This strategy gives you a final ranking of the best-in-class products on the market. When it comes to finding the best cooling pillows, we’ve judged the following criteria to be the most important. The material used, how easily it can be washed, and whether it worsens allergies. If you’re after that rare combination of comfort and cost, look no further than this pack of 2 pillows. Part of the Beckham Hotel Collection, these pillows guarantee hotel quality. They also come vacuum-sealed, ensuring they don’t pick up dirt, staining, or odors en route. 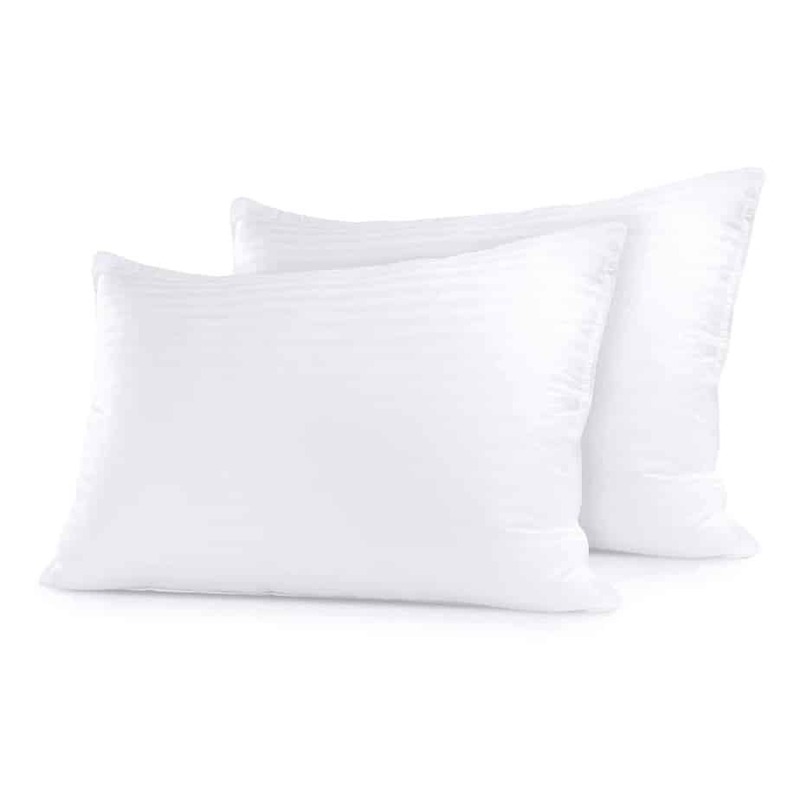 Filled with plush gel fiber, these Beckham Hotel pillows forego popular memory foam, but not at the cost of comfort. The outer casing is resistant to mold and mildew, as well as being fade resistant, and it’s adept at repelling stains. These pillows are backed by a 30-day product guarantee, so you can try them for a few weeks and make sure they’re right for you. At $40 for a 2-pack, this is one of the best values out there. And they’re just as good at staying cool as their much more expensive counterparts. For all of these reasons, the Beckham Hotel Collection Gel Pillow is an easy choice for the best cooling pillow. 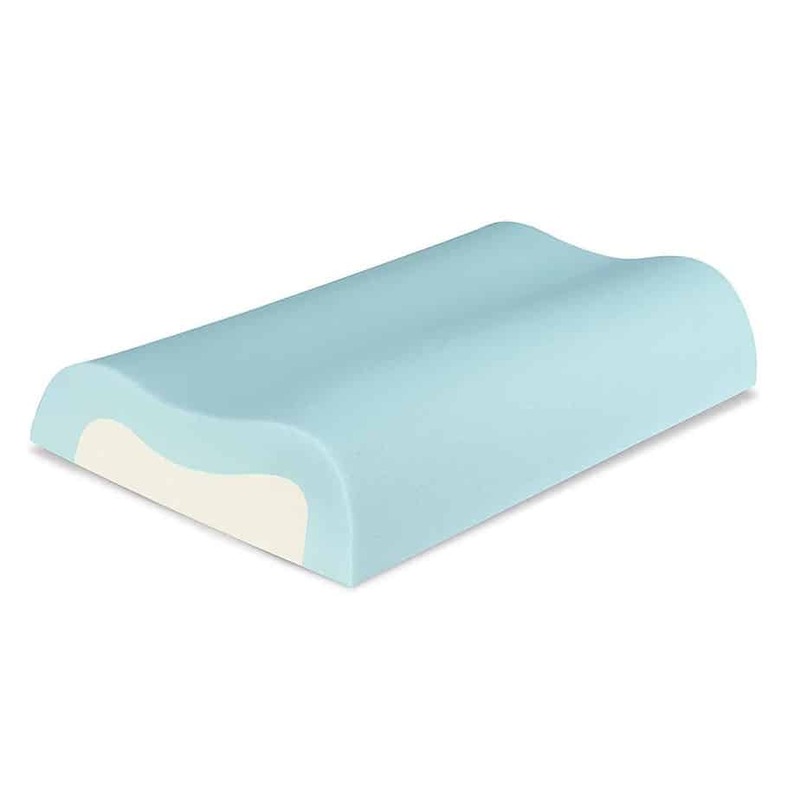 Shredded memory foam helps keep a pillow malleable, while offering the same superior support that this type of foam is known for. The Coop pillow’s finer-than-most shredding means that it has even greater buoyancy than many competing products. There’s even an instructional video on how to remove a portion of the fill so that you can get the exact loft you want. The whole product has been crafted with hypoallergenic and dust mite resistant materials. Though it starts off with a mild chemical smell, that dissipates quickly, and new odors don’t stick to the material. The pillow is also machine washable and can even be thrown into the dryer, which is the perfect way to refresh its shape. All these traits are backed by a 100-day, no-questions-asked guarantee. Despite a few minor complaints, the Coop Home Goods Original Pillow is, without question, one of the best pillows on the market. 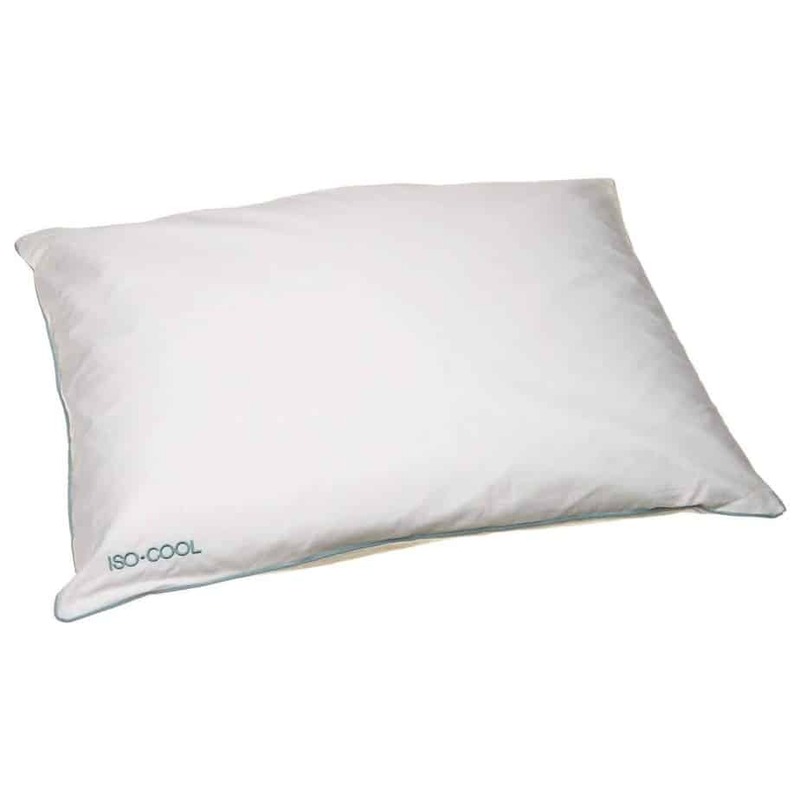 The Iso-Cool pillow is the first pillow on our list to belong to the PCM (Phase Change Materials) category. Microscopic beads inside the pillow adapt to your body’s changing temperature. When you’re hot, they absorb heat to cool you down. If you’re cold, the product releases heat. This makes it ideal not only for summer months, but for fall and winter too. The inner structure consists of memory foam, which is contoured for neck support. There’s no additional gel or water pocket, but it’s not needed thanks to the PCM. There’s also a matching mattress topper that extends the cooling to your whole body, though it’s sold separately. This pillow provides just the right amount of support for a variety of sleeping positions. It’s neither too squishy nor too firm, supporting the spine’s natural alignment. The cover is 100% cotton, so it can easily be removed for machine-washing. While memory foam is ideal for reliable neck support, it isn’t the best at keeping cool and well-ventilated. But the Cool Contour has a memory foam structure that is less dense than most memory foam pillows. Air can circulate more freely, making for a much more “chill” sleeping experience. Where this pillow really excels is in its support for people who tend to toss and turn in their sleep. Multi-level contours are perfect for a range of sleeping positions, designed to support your spine’s natural alignment. Whether you snooze on your stomach, back, or sides, you won’t wake up with a stiff neck. As far as warranties go, this product is a step ahead, with 5-year coverage for the Cool Contour. But these points aside, there are no other frills to speak of, such as hypoallergenic materials. That’s why this pillow slips down to fourth place. The shredded memory foam in the Snuggle-Pedic Cooling Pillow lends itself to much better air circulation than solid memory foam. 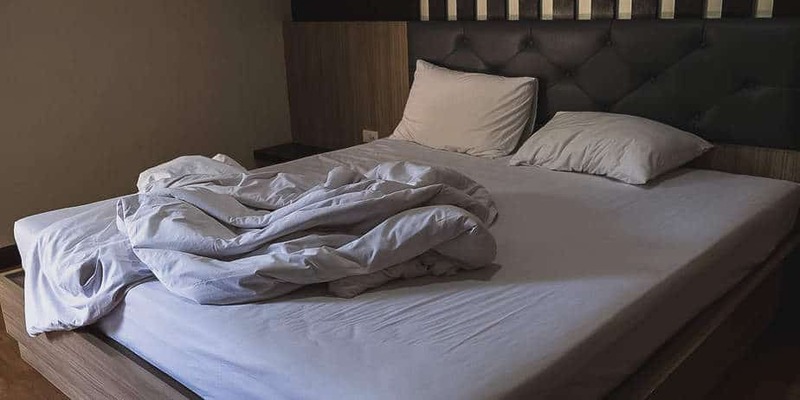 Although it doesn’t offer the same level of support as solid memory foam pillows like the Sleep Innovations pillow above, it’s a good choice if cooling is a priority over firmness. And, unlike the solid variety of memory foam, you can machine-wash the entire pillow. 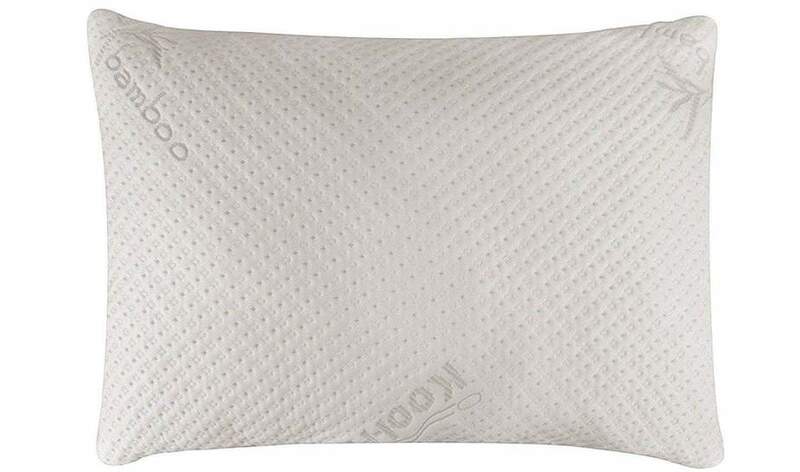 For the eco-conscious, this cooling pillow is an absolute dream. Both the cover and the fill utilize natural bamboo, and the pillow is compacted for transit, reducing packaging. You can even customize your own specific blend of pillow fill. The main complaint for this pillow is in the need for personal adjustments. You can remove or add shredded filling to achieve the height and support that’s right for you. However, although this is a useful feature, finding that sweet spot can take more than a little trial and error. The Malouf Z’s distinctive look comes from its unique composition. While most pillows opt for cotton, polyester, bamboo, or buckwheat, this pillow utilizes 100% natural Talalay latex in its highly original design. 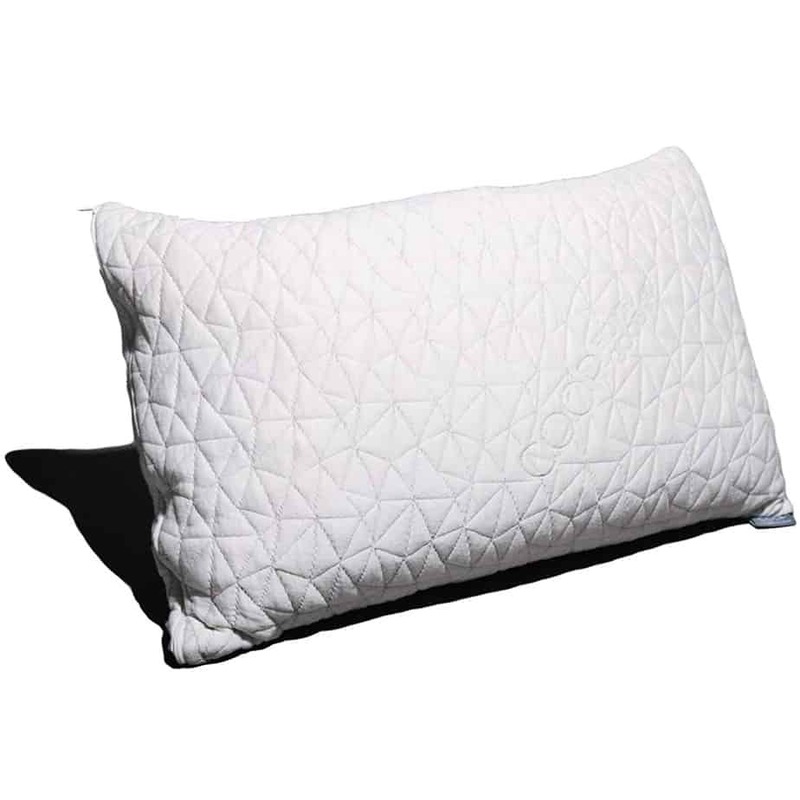 Barring latex allergies, this pillow is an excellent choice for its hypoallergenic properties. The latex used in the pillow comes from sustainable sources. It is also resistant to mildew and dust mites. The material is known for having exceptional moisture-management properties, helping to reduce sweating. Our main gripe is that this pillow has a price tag of 3 figures, yet isn’t great at remaining cool. That’s not to say that it isn’t effective as a cooling pillow, or that it isn’t comfortable, but it’s definitely not at the top of the charts in terms of value for money — which is why it drops into sixth place on our ranking. Not everybody likes their pillows thick and plush, which is where the Xtreme Comforts Slim pillow comes into play. It’s still malleable and easily shaped to your preference, but offers less loft than most other options. You could stack several of these pillows for additional height without putting a crick in your neck. The cover is made from bamboo and feels extremely soft against the skin. Unfortunately, these plus points are overshadowed to a degree by the fact that the fill cannot be adjusted. Many shredded foam pillows offer this function, so it’s definitely something that you’ll notice is missing. Still, there’s nothing to lose from giving it a try, as the consumer reviews are overall very positive. What’s more, there’s a 30-day guarantee. And the real selling point is the 6-year warranty — well beyond what’s offered by the vast majority of pillows. As a shredded memory foam pillow, the Sleep Whale makes a good budget alternative to the Coop Home Goods Original. That said, it’s not quite equal in quality and suffers from some minor issues with fill distribution and chemical odors. Negatives aside, we really liked the double-zipper design that offers greater odor and staining protection. The fill is secured within a zipper compartment that you can access to increase or reduce the loft. This compartment is contained in a zippered pillowcase that can be machine-washed. The opening to the shredded memory foam compartment is fairly small, so you may struggle if you have larger hands. However, the ability to adjust the level of fill is a great addition for such an inexpensive product. The Classic Brands Cool Pillow is a unique beast, in that it combines the benefits of memory foam and gel. You’ll be able to sleep on foam when it’s cool, or flip to the gel when things heat up. It’s heavier than most pillows, but it’s bigger too, making it perfect for king or queen-sized beds. The gel layer does a great job of absorbing your excess body heat, though it doesn’t perform as well in a hot room. The memory foam is supportive and not overly dense. Just be wary that the thickness of this pillow might not suit stomach sleepers. What drops the pillow into ninth position is the implementation of the multipurpose design. Though having the choice between gel and foam is useful, this pillow is at the low end of the price scale, and it shows. If the gel or foam were better quality, the cooling qualities and comfort would be much improved. The Sleep Restoration Gel Pillow is larger than your average pillow, so if you could use some extra wiggle room for your head, it could suit you well. These pillows tend to be thicker and heavier than many alternatives as well, so you might need fewer pillows than usual. A premium cotton shell is stuffed with gel fibers that many customers have reported feels like real down. But this pillow is not just soft: It’s practical, too. It’ll resist fading from natural light, and it stands up well to both stains and odors. Unfortunately, you can’t simply throw this pillow into the washing machine. Though you can sponge it down, that method is much more inconvenient and time-consuming. The warranty is shorter than many others on our list, too. How do cooling pillows work? The point of a cooling pillow is to reduce body temperature when excess heat makes it difficult to sleep. How your cooling pillow achieves this feat depends on the type you buy, though the principle is essentially the same. Memory foam pillows offer some degree of cooling compared to basic foam, but for best results, they’re normally combined with a gel layer. The gel works by absorbing heat directly from your body into the gel itself. Shredded memory foam is an improvement as far as cooling goes. Pillows with this type of fill offer the same support as memory foam, while increasing surface area for much-improved ventilation. 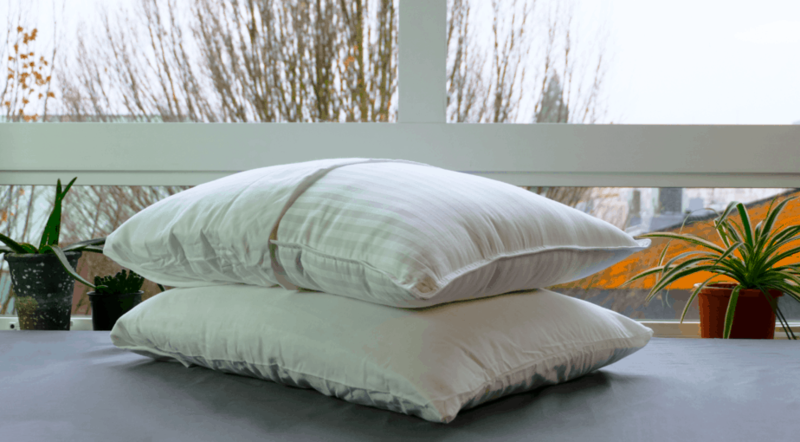 Finally, you have pillows made with PCM, or Phase Change Materials. These materials shift from a solid to a liquid state at different temperatures. During this transition, heat is either absorbed or radiated. When heat is absorbed, the materials produce a cooling effect. Who should use cooling pillows? If you’re going through menopause and experiencing hot flashes. Always check the type of materials in the pillow before you use it. If you have allergies, it’s best to find a product that uses hypoallergenic materials. Also be wary of pillows made of latex (like the Malouf Z) if you or anyone you live with has a latex allergy. Can I wash a cooling pillow? 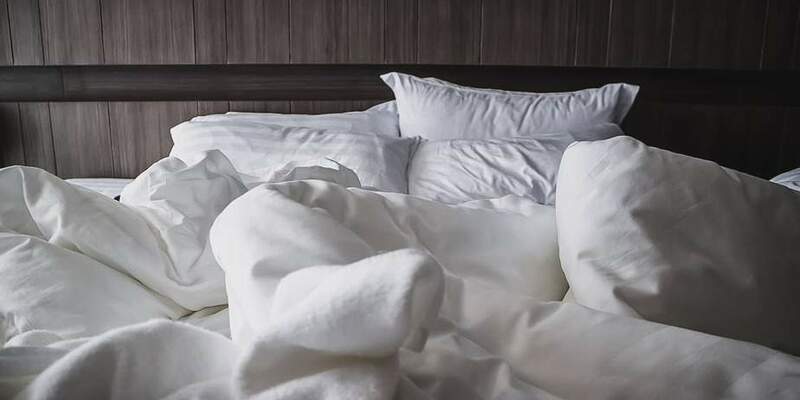 Whether or not a pillow can be machine-washed depends upon the materials used in its construction, and this isn’t limited to just cooling pillows. It’s important that you know which kinds of pillow can be washed in a machine. Otherwise, you could damage them. Since most pillows on our ranking feature memory foam, we’ll focus on this type of material. As a basic measure, you should get into the habit of running a vacuum cleaner over your memory foam pillows. This will help keep them free of any debris and dust, which could also cause allergies. You should never put a memory foam pillow into the washing machine, as it’ll wreck the structure. Instead, wash memory foam by hand using gentle cleaning products, and try to avoid entirely submerging them in water. You can spot clean by hand with a cloth, or use a spray bottle with a mild soap solution. As far as drying goes, air drying is the safest choice, though machine-drying is usually fine. Cotton, feather, fiber, and shredded memory foam-based pillows can all go through the washing machine. Be sure to remove the covers first, and wash these separately with the bed sheets. The bare pillows should be washed together, but independently of the bed linen. What are the best cooling pillows? We’ve analyzed hundreds of genuine experiences and opinions by scouring customer reviews from across the internet. We’ve also taken into consideration key factors like comfort, build quality, and the type of material used. Our ranking of the best cooling pillows is based on this aggregated data, giving you a true picture of the very best products available. From our research, we can recommend the Beckham Hotel Collection Gel Pillow as the best overall cooling pillow you can buy right now. It doesn’t absorb odors or stains easily, and its gel fiber filling offers just the right amount of support for most sleepers. Plus, it’s an excellent value for the money. Our best eco-friendly cooling pillow is the Sleep Restoration Gel Pillow, which won’t weigh on your conscious if you’re worried about the environment. Finally, for the best budget pillow, there’s the Snuggle-Pedic Memory Foam Cooling Pillow. So now you’ve discovered how much better your sleep can be with a cooling pillow. We’ve put together some additional recommendations to help you rest easy. Honeywell HYF290B 8-Speed Tower Fan: When things heat up in the summer, a tower fan can ensure you don’t miss any sleep. ExceptionalSheets Bamboo Mattress Pad: Why stop at having a cooling pillow on your bed? Bamboo is an excellent material for keeping your temperature down. Trtl Travel Pillow: Maintaining proper posture during power naps on a plane is just as important as having high-quality pillows at home. Gel Cooling Eye Mask: Bright summer mornings are nature’s way of getting you out of bed, but that doesn’t mean you always want an early start. Reusable Silicone Ear Plugs: You’ll never be woken by your partner’s snoring again.